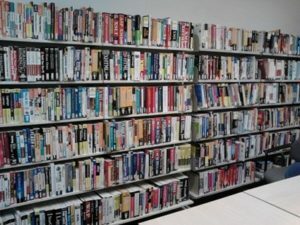 As a service to members of Melbourne PC User Group, a reference library of approximately 900 computer books is provided at our Moorabbin Headquarters. Members who come in to the Headquarters may just browse books on the shelves, or borrow a book and retain it on loan for a period of one month. A limit of three books may be on loan to any one member at one time. To assist in book selection, a link to the list of all books in the library, and a second link to the coding scheme used to classify books are given below. Current copies of three magazines are placed on display for reference by visitors to the library: 1. APC 2. PC & Tech Authority 3. Choice Computer. The most recent issues of these magazines are not for loan & have labels on the front indicating this; older issues are available for loan & have labels on the front too: just write the details in the library register. All books on the shelves are available for borrowing by members. A member may have up to a maximum of 3 books on loan at one time. Computer PC1 in the internet lounge may be used to search for Titles, Subjects etc [BOOK LIST in the desktop], but not for registering borrowings. N.B. The library is of necessity run on an honour system. Our voluntary Librarian Clemens Pratt (cpratt@melbpc.org.au) checks loans and returns once a week. Please observe the above simple borrowing rules and save our group postage and telephone calls chasing up overdue books. New titles will be added as opportunity presents. To help modernise the library’s holdings, donations of books within the interests of Melbourne PC User Group published in recent years are welcome (less than 10 years); also cash donations for purchasing recent releases. Books can be left in the Library Box, cash given to our office at Melb PC HQ at Moorabbin. On request, donations will be acknowledged by a notation in the books themselves. News Item – 7 June 2017: Some donated books: Following a substantial donation of books from his personal collection by former member & volunteer John Carassellos, the older books will be offered progressively to members on a “free to a good home” basis. However the following books have been catalogued & added to the library & are available for loan (library code followed by title & date): 1 DBA-37 Get the Most from Microsoft Access for Windows (2007) 2 DPD-05 InDesign CS3 for Windows & Mac (2008) 3IOO-29 Microsoft Office 2013 QuickSteps (2013) 4 MU-64 Teach Yourself Visually Dreamweaver CS3 (2007) 5 DBA-38 Microsoft Access 2010 for Dummies (2010) 6 IOO-30 Microsoft Office 2010 for Dummies (2010) 7 GRP-10 Microsoft PowerPoint 2010 for Dummies (2010) 8 IOO-31 Microsoft Office 2013 for Dummies (2013). Our thanks to John. News Item – 1 April 2017: Borrow a magazine: You can now borrow a magazine from the display on the library table: APC, PC & Tech Authority, and Choice Computer. The most recent issues of these magazines are displayed for reference only, but older issues are labelled NOW AVAILABLE FOR LOAN and may be borrowed for a month – just enter the details in the library register. When you return the magazine, enter the return date also in the register.